Sonic Pi version 2.6 is hot off the press, but already Sam Aaron is pushing on with the development for version 2.7. Sonic Pi is a living program and it needs to grow and improve constantly. In the last couple of days I have noticed the addition of a large set of single cycle samples of a wide range of instruments – (the freely available http://www.adventurekid.se/akrt/waveforms/adventure-kid-waveforms/) As yet they are not fully incorporated in Sonic Pi, as they would normally be used to generate samples using them as raw material. As Sam says in the commit where they were added. “Samples – add the fabulous Adventure Kid Waveforms- for future use for wavetable synthesis”. 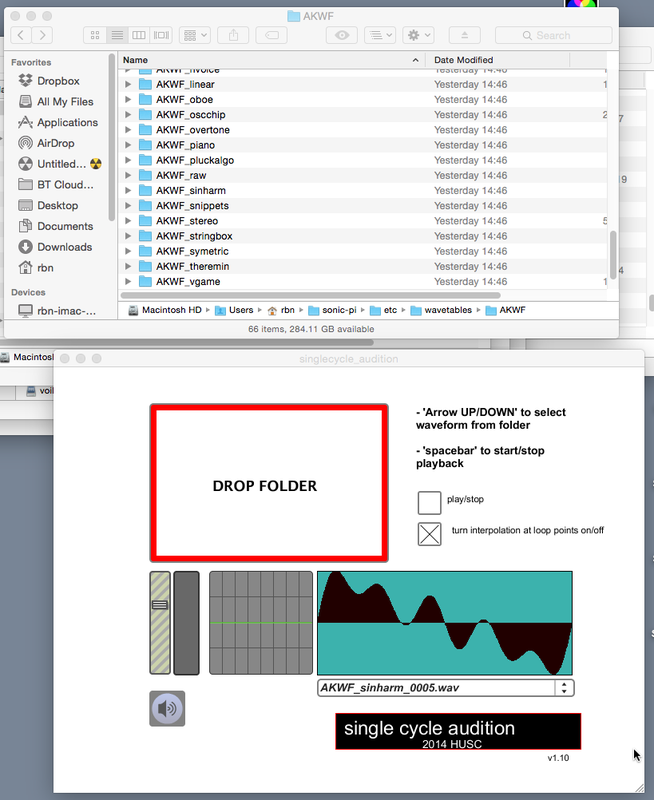 If you unzip and run this program you can drag one of the AKFW folders which are installed in the etc/wavetables folder in the latest sonic pi 2.7dev downloads and drop it onto the window of this tool as shown below. You can then use up and down arrow keys to select a sample and spacebar to toggle playing or silent. To do this I followed the following steps. 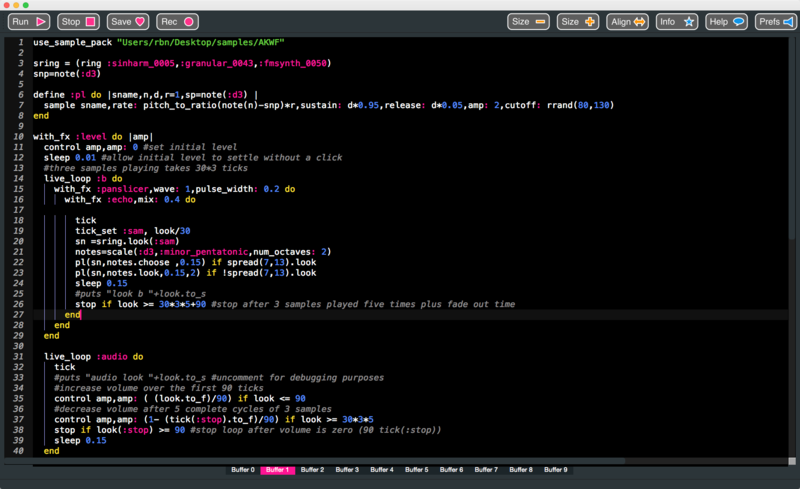 I then played around with these three samples in sonic pi. I found that they all had a fundamental frequency equivalent to note :d3 and using this was able to produce different “notes” utilising the pitch_to_ration function. sname was the sample name, n the note to be played, d the duration of the note, r a rate multiplier which I used to transpose an octave when required setting r = 2, and sp was the “normal” pitch of the sample. Change one or other or both of the .choose to .look. Change the first one to .tick Change the spread(5,13) of one or the other to spread(7,13) or change both. Finally, as a fixed performance I used the code below, which uses a separate control live_loop to fade the audio level up to max, and after a pause fade it out to zero again. I am always amazed at how versatile sonic-pi is. It is a great platform on which to make music, play with code and generally have an amazing creative time!